We all have people in all of our lives that we would do anything for. But should that include co-signing a mortgage. Here are some questions you should ask yourself before agreeing to co-sign on a mortgage. WHAT DOES CO-SIGNING A MORTGAGE MEAN? When someone’s financial history shows they may be an unreliable borrower, it’s often recommended that they get a co-signer. This means that someone who may not be living in the house and isn’t necessarily making payments is just as financially responsible for a home as their co-borrower. Often times, if a person is married, their spouse will be the co-signer on the home. A co-signer is usually requested by a lender when they feel the borrower doesn't have enough credit or there's a potential for not making payments. Often, a co-signer will help the borrower meet the requirements of the loan. The co-signer's credit score is taken into account and their income is considered the borrower's second income. WHAT'S THE RISK OF CO-SIGNING? When you co-sign on a mortgage, you go through the same process as if you were buying the home yourself. This means that you authorize the lender to complete a hard inquiry on your credit resulting in a lower overall score. Being a co-signer can also make it difficult for you qualify for future lending. Too many lines of credit or loans show potential lenders you may depend too much on credit. If your co-borrower makes late payments or stops paying all together, this may also affect your credit. If a default takes place on the loan, it affects both parties equally. Personally, it may also affect your relationship with the borrower. This is a business agreement and needs to be treated as such. Make sure the expectations are lined out clearly and what the consequences will be if those are not met. HOW LONG DO YOU REMAIN A CO-SIGNER? As a non-resident co-signer, you will usually have to remain on the loan until the primary borrower’s credit improves or they have a sufficient income. 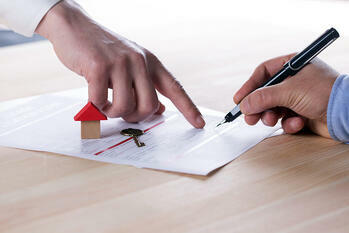 Following this, you can request to have your name removed from the loan by working with the lender.